Could this $30 million green tower be the future of world cities? Slideshow: A greener, cleaner office building? Earth Day co-founder Denis Hayes and architect Jason McLellan are behind a project that aims to build the greenest office building ever. SEATTLE – An office building that lasts 250 years with no monthly electricity or water bills? It may sound like an environmentalist’s pipe dream, but it will soon be a reality, say the builders of what they hope will be the biggest office tower in the nation that produces as much water and electricity as it consumes. 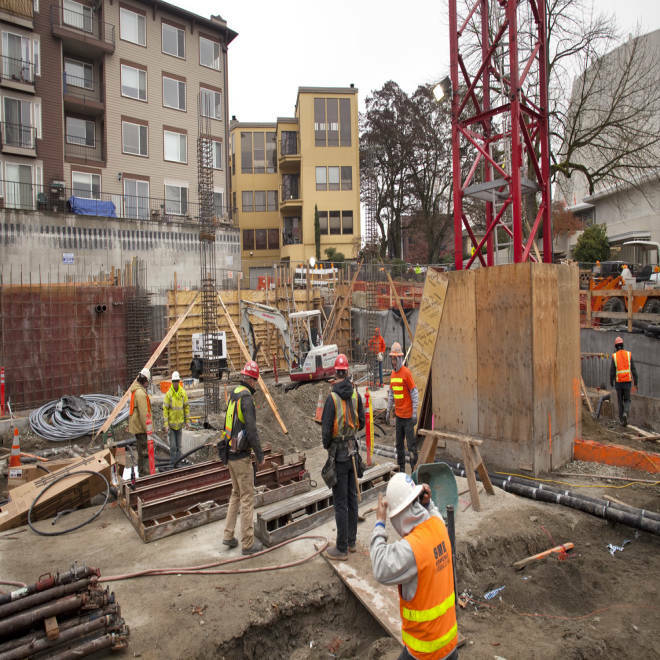 Currently rising from a pit in downtown Seattle, the $30 million, six-story “living building” is being spearheaded by Denis Hayes and Jason McLennan, who believe they can save the world one building at a time by reducing the massive energy appetites of modern cities. "Eighty-two percent of Americans, and more than half of humanity, now live in cities -- none of which have been designed for sustainability," said Hayes, who in 1970 helped create Earth Day, which has developed into the planet’s unofficial holiday. Hayes, 67, now heads the Bullitt Foundation, an environmental nonprofit that intends to practice what it preaches by moving into the building when it’s completed, currently planned for November. The Bullitt Center, as the building will be known, is designed to use just a third of the energy consumed by a typical office building its size. It also aims to minimize its resource footprint by generating electricity from solar power, collecting water from rainfall and treating all sewage and wastewater onsite. It also will have no parking for cars -- just racks for bikes. It won’t be entirely off the electrical grid, so that it can make it through the periods when there isn’t enough sunlight to meet the tenants’ demands. But it will later repay those withdrawals, said McLennan, 38, who is CEO of the Northwest-based International Living Future Institute. "In the summer it gives excess energy to the (power) grid and in the winter it gets it back when we can't generate enough," he said. "It nets out at zero on an annual basis." As for the water system, Seattle law requires the building be hooked up to its water supply but the goal is to take in enough rainwater to make ends meet. Standard buildings are a "negative gift" to taxpayers, he said, because of the burdens they impose in terms of pollution and wasted energy. "We clean up our own messes ... that's the big picture," he said. Hayes said that in addition to being self-sufficient, the building will make sense financially, explaining that while it may cost a third more to build than a traditional office building, it is designed to last centuries longer. "We are using the Bullitt Center to explore what is possible on the cutting edge of green, using existing technology and constrained by reasonable economics," said Hayes. "Durability is key. The average building lasts 40 years, we're going for 250 years. ... It's a fundamentally different approach." Getting the building to last 2 1/2 centuries, McLennan said, comes down to three factors: quality building materials; careful and clever detailing from the architecture firm; and high quality construction from the contractor. Ultimately, the partners hope to get the Bullitt Center certified under the “Living Building Challenge,” which is run by the Living Future Institute. In order to be certified as a living building, developments much meet benchmarks in seven performance areas. The slideshow at the top of the story illustrates those areas, each of which includes several "imperatives," such as "car-free living" and "urban agriculture." So far, about 140 projects are registered for the Living Building Challenge, including a handful in Seattle. Only four have been certified as meeting the challenge criteria so far, as many are under construction or have not yet met the year of occupancy necessary for certification. Most are small projects; a few are office buildings, but none is as large as the Bullitt Center. Net-zero homes have been around since the 1970s, but McLennan noted that it's "much harder to achieve this in a larger building, as the larger the building the more difficult it is to generate all your own energy and harvest all your water. Scale makes it challenging." 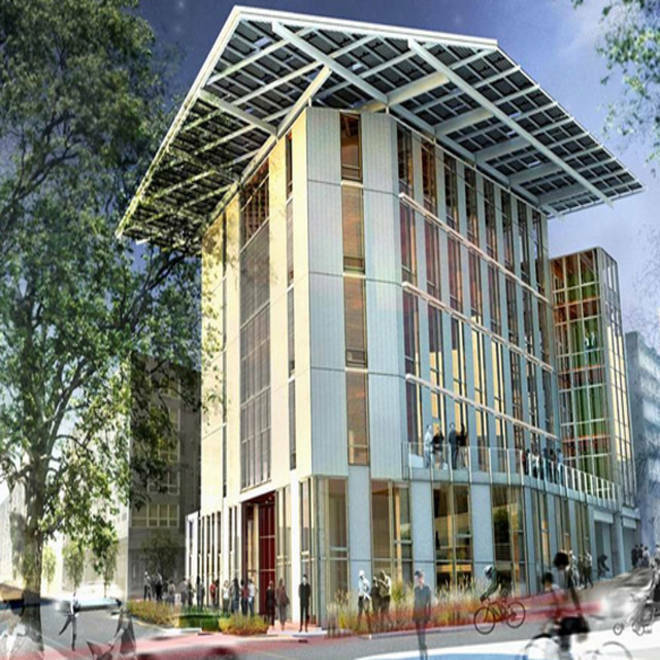 If the Bullitt Center is certified as a living building, it will be the largest net-zero office building in the U.S., McLennan said. A three-story Center for Sustainable Landscapes also is under construction in Pittsburgh at Phipps Conservatory and Botanical Gardens, he noted. Water will circulate through 26 geothermal wells, each 400 feet deep in earth that's a constant 55 degrees, to help offset heating costs in winter. Rainwater will be collected in a 56,000 gallon basement cistern. Purification steps include a special membrane for the roof, ultrafiltration and ultraviolet light. Because the process has to be tested before Seattle will consider authorizing it for drinking water, sinks and showers, Hayes calls it "the last big hurdle" for the center. Sewage will be sent to 10 basement composters and then shipped offsite to become fertilizer. All timber frames and other wood will be certified as sustainable by the Forest Stewardship Council. The criteria for certification, McLennan said, are "more high performing" than the standards of the better known LEED, for Leadership in Energy and Environmental Design, which were developed by the U.S. Green Building Council and adopted by many developers across the country. "It's time to move the ball farther," he said, adding that "single projects can change the way the design community thinks." The U.S. Green Building Council said it welcomes the living building concept and has worked closely with McLennan, who also runs the council's Seattle chapter. "It's more challenging," acknowledged Scot Horst, the council's vice president for LEED. "Most buildings that attempted but couldn't meet the (living building) criteria were still LEED certified." The six-story Bullitt Center will block the downtown views from the apartments at left, as well as partly obscure those from the condos in the center of this photo. Even a cutting-edge development like the Bullitt Center can have difficulty meeting the living building benchmarks. For example, it is replacing a single-story bar and thereby covering up the views from apartments behind it. That would appear to violate the Living Building Challenge's "equity" imperative: "The project may not block access to, nor diminish, the quality of fresh air, sunlight and natural waterways for any member of society or adjacent developments." But McLennan notes the apartments went up knowing that the Bullitt property would some day be developed. "The windows for the adjacent building were placed along an alley where development was always expected and part of city zoning for that site," he said. Hayes said tenants will get a rent reduction in return. "It's not a perfect solution but we're doing what we can," he said. McLennan added that the upsides -- more diversity and added jobs in the area -- outweigh any downside. Architects from Pink Cloud leap into the future with their eco-friendly vision of turning oil silos into low-cost housing and share their award winning ideas with Msnbc.com's Dara Brown. Eco-friendly projects aren't immune to the community frictions that often greet new developments. In Wallingford, a neighborhood of homes and low-rise commercial buildings in Seattle, a green developer inspired by the Bullitt project says it needs to exceed the city's height limit in order to make its building cost effective. That has angered neighbors like Katherine Bragdon, herself an environmental activist, and put the project on hold as city government deals with the opposition. "No developer should be given special privileges to exceed current zoning by 44 percent, impair views that belong to the public, and trump years of work and consideration that have gone into neighborhood planning," Bragdon said. "I’ve worked on a number of conservation campaigns around the country over the past two decades so I want to stress that I respect and value the green building aspect of this project. … But I also believe that we can’t trample over one good cause (well-planned neighborhoods, public process, fair zoning) for another."